HOLY CITY OF THE WICHITAS, Okla. – In its heyday, the “Prince of Peace” Easter pageant in this mountain wildlife refuge northwest of Lawton featured 3,000 performers and drew an audience estimated at 225,000. Leona Dean was 2 years old. Her father helped build this living stage of stone buildings that tells the story of Jesus Christ‘s life, death and resurrection. So the McAlester woman had been here before last weekend’s opening of the 76th annual Wichita Mountains Easter Pageant. The nation’s longest-running outdoor passion play began in 1926 – the dream of the Rev. Anthony Mark Wallock of Lawton’s First Congregational Church. It has survived three-quarters of a century. The cast size and the crowds, are not what they once were. “We fight all year long to get enough people to participate in it,” said Frank Tucker, president of the Wallock Foundation, the nonprofit group that oversees the pageant. Dean, 64, and her sister, Norma Traylor, 66, brought blankets and sleeping bags as they grabbed spots on the hill overlooking the pageant. They sat under the stars and watched 250 actors from 6 months to 80 years old depict biblical characters. Tucker estimated the opening crowd at 500 to 750. The pageant’s final performance will start at 9 p.m. Saturday and stretch past midnight. Admission is free, but a collection is taken to defray expenses. If the weather is good, Tucker expects a crowd of about 5,000 – a fraction of the number who once came. “Our lifestyles have changed dramatically,” said Scott Parker, director of the University of North Carolina’s Institute of Outdoor Drama. 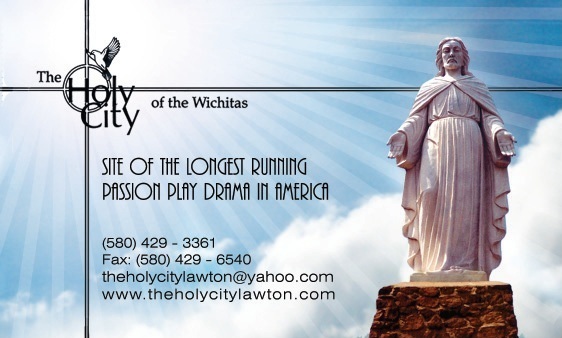 Holy City faces competition not just from ESPN and movie channels but also from several area churches that produce Easter dramas, not to mention events such as the car show in Lawton last week. Visitors can bring coolers to the show, but pageant officials check them to make sure nobody tries to sneak in alcohol. Don Wooley, 54, of Lawton first came to the pageant when he was 5. These days, Wooley works in the pageant’s parking detail and points a sly grin toward the newcomers who bring young children along. “I’ve never seen a pageant where people weren’t cold and miserable by the time they left,” he quipped. Nevertheless, people such as Thelma Kipe wouldn’t miss it. Her involvement started 25 years ago when she joined the cast. Over the years, her children and grandchildren all donned angels’ wings for the show. In the latest production, Kipe provides the voice for Martha, the sister of Lazarus. “I just love the Holy City,” she said. “I love what it stands for – the birth, death and resurrection of Jesus Christ, our Lord and Savior. What it takes, she said, is a dedicated group of volunteers. Jane Jayroe, executive director of the state Tourism and Recreation Department, echoed that sentiment. The Holy City grounds draw an estimated 350,000 to 400,000 tourists a year. “Something like that cannot be ongoing without tremendous dedication from the local citizens,” Jayroe said. Matthew Mancebo, 14, plays a variety of characters in the pageant – a wise man, a rich fool, a good Samaritan, Satan and Barabbas. “I like the scenery,” said Mancebo, an eighth-grader at Lawton Eisenhower Junior High. Despite the dwindling numbers, Frank Tucker said he sees no reason why the pageant won’t last another 25 years. “What it boils down to is how badly someone wants to keep it going,” Tucker said. When: The pageant starts at 9 p.m. Saturday. Arrive early (music starts at 3 p.m.) and find a spot on the grassy hill. It gets chilly at night, so bring blankets. Also, bring several layers of clothing, including a sweater and a jacket. Lawn chairs are helpful. Eating: Coolers with soft drinks are allowed, but alcohol is prohibited. A concession stand will offer hot dogs, barbecue sandwiches, nachos, candy, water and drinks. Getting there: Take the Medicine Park exit off Interstate 44 and travel about 10 miles into the Wichita Mountains Wildlife Refuge. Follow the signs to Holy City.